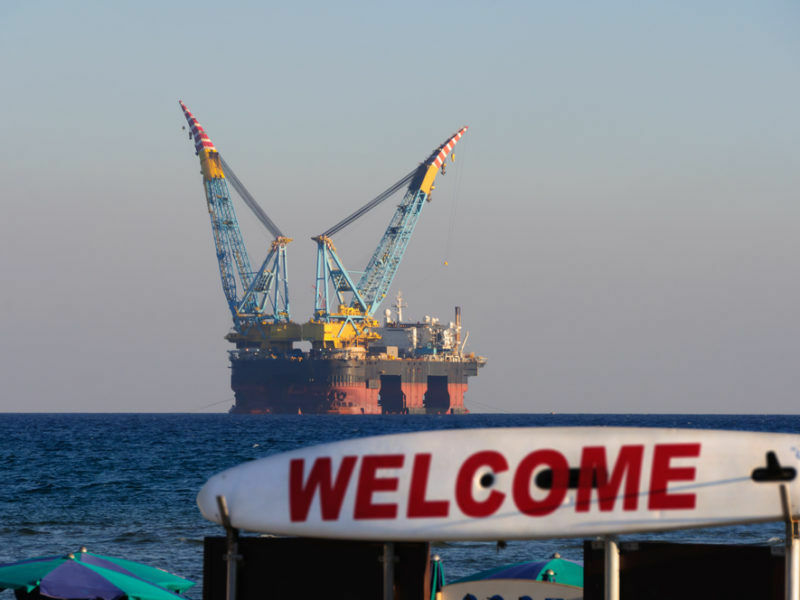 The discovery of massive natural gas fields off Israel’s northern coast more than a decade ago and subsequent attempts to export this gas to Europe have highlighted the true fault lines in the Turkish-Israeli alliance. The relationship between Turkey and Israel has never been an easy one to understand. Since formal relations crystalised in 1949, with Turkey becoming one of the first majority Muslim countries to recognise Israel, both countries have found themselves at an arm’s length with the rest of the Middle East. By the time Israel sent medics to assist victims of Turkey’s tragic earthquake in 1999, the two countries were sharing military technology and bilateral trade was booming. The relationship then took a sour turn, at least rhetorically. A war of words between Turkish President Recep Tayyip Erdoğan and Israeli Prime Minister Benjamin Netanyahu reached a fever pitch over the last decade and seemingly threatened the foundations of this unique partnership. Many observers, however, believed the alliance was never really at risk, due to the sheer amount of trade that moves between the two countries. But now, all that has changed. The discovery of massive natural gas fields off Israel’s northern coast more than a decade ago and subsequent attempts to export this gas to Europe have highlighted the true fault lines in the Turkish-Israeli alliance. Recent events reveal a fundamental shift in the alliance is undeniably underway. As part of his phenomenal rise to power, Erdoğan convinced Turks that Turkey was set to re-emerge as a new Ottoman empire, with Istanbul as its beating heart. With his conservative religious background, Erdoğan saw himself a new type of sultan for this neo-Ottoman state, one who understood how to blend neo-liberal economic policy and socially conservative politics. While the economy was booming, Erdoğan had few reasons to create enemies. In the late 2000s, ultra-low interest rates opened up cheap cash flows that were used to fund mega projects across the country. In Istanbul, a new bridge across the Bosphorus, a new airport, and even plans for a new canal were dreamed up. Turkey also espoused a unique form of soft power that privileged a policy of “no problems with neighbours.” Then, the Arab Spring swept across the region and, sensing a shift in power dynamics, Erdoğan bet squarely on the Muslim Brotherhood. It proved to be a losing proposition and the policy of “no problems with neighbours” was left in tatters. At the same time, the period of ultra-low interest rates came to an end as the US economy began to strengthen. Turkey’s current account deficit began to balloon as anti-government protestors took to the streets. With the neo-Ottoman vision fraying, Erdoğan did what many other politicians in the region have done before him: he embraced the Palestinian cause. Becoming one of the most vocal supporters of Palestinian rights in the region, Erdoğan relentlessly attacked Israel. He allowed a boat-full of activists to depart Turkish shores in an attempt to break the naval blockade of the Gaza Strip and sparred repeatedly with Netanyahu. Despite the chest beating, the economic relationship between the two countries actually deepened during this period. Of all the routes that Turkish Airlines flies, its most popular remains that between Istanbul and Tel Aviv. This brings us to Israel’s natural gas. Turkey is famously devoid of energy resources of its own but is ideally located between Europe and energy-producing areas in Central Asia and the Middle East. Part of Erdoğan’s grand vision was to establish Turkey as a dominant energy transit hub. Israel’s discovery of massive natural gas fields in the mid-2000s was a critical part of this strategy. With Europe looking for new ways to source natural gas that cut out Russia, the European Union sought Israeli gas. Even as Erdoğan was publicly decrying Israel’s treatment of the Palestinians, his government was working tirelessly to carve out a deal with the Israelis. Cyprus, Greece, Israel and Italy signed a memorandum of understanding to build the world’s longest underwater natural gas pipeline to supply Europe. At the same time, Turkey was courting the Kurdistan Regional Government (KRG) in northern Iraq to create a new oil pipeline that would move crude oil through Turkish territory to the Mediterranean coast. Despite ramping up military action against Kurdish rebel groups, his government was inking energy pipelines with the KRG at the immense displeasure of the Iraqi government. But 2018 hasn’t been good for Turkey’s energy ambitions. In a significant rebuke to Erdoğan, Israel agreed in principle to a US-backed natural-gas pipeline deal with Cyprus and Greece in late December. The deal will all but cut Turkey out of Israel’s natural-gas fortunes, and see the creation of a 2,000-kilometer long EastMed pipeline through Cyprus and Greece, which would then supply the rest of the European Union. Costing $7 billion, the pipeline will have the capacity to move 20 billion cubic meters of gas annually. Turkey has strongly rejected the plan, saying it would mobilize military forces if Cyprus attempts to exploit any gas resources without Ankara’s permission. Erdoğan’s old partners have finally had enough of his rhetoric and stratospheric ambition. While Israel was once eager to use Turkey as an energy transit hub, it now sees much less value in the partnership. Netanyahu has cultivated fresh alliances with right-wing European leaders such as Hungary’s Viktor Orbán. Donald Trump has shown that he will protect Israel’s policies in Palestine to every degree possible. Turkey, in its weakened economic and geopolitical state, has much less to offer. While the Turkish-Israeli alliance will continue in some form or another, once the pipeline deal is formally signed this year after EU regulatory scrutiny, the relationship will enter a new and weakened phase. Economics, after all, has always driven the true calculations of both countries.